One of the people I'd always hoped to meet. He's been a presence on my shelves so long that I'd kind of presumed he was utterly ancient, not a mere handful of years older than myself. Terribly sad to hear this. This is very sad news; so unexpected. We will miss Richard's contributions to the Everlasting Club very much. This has come out of the blue - but I was quite literally thinking about him as the email arrived - and also about you, Sandy, because of your letter concerning Montague Summers in a recent Fortean Times.Richard did such admirably valuable work in making available out of print tales and sharing his immense knowledge - only the fact that he never quite accommodated the computer age had diminished his influence in more recent years. I met him on several occasions in York, among like-minded friends, and through the pages of The Everlasting Club (which, alas, couldn't last forever for me because of pressure of work and issues of health.) He was always full of the good stuff and I doubt we shall look upon his like again. Yes, I always wanted to email him and everyone told me he doesn't do that. Well, I do not tweet or Facebook so good for him. I see Ken Faig comment - the contributors to the Summers gravestone are here. I still have Richard's Summers piece in Book & Magazine Collector from the 80s. Richard & I traded books for many years. The last one he sent me was Rebecca Tope's new biography of Sabine Baring-Gould; the last I sent him, Stefan Dziemianowicz's anthology Great Ghost Stories. 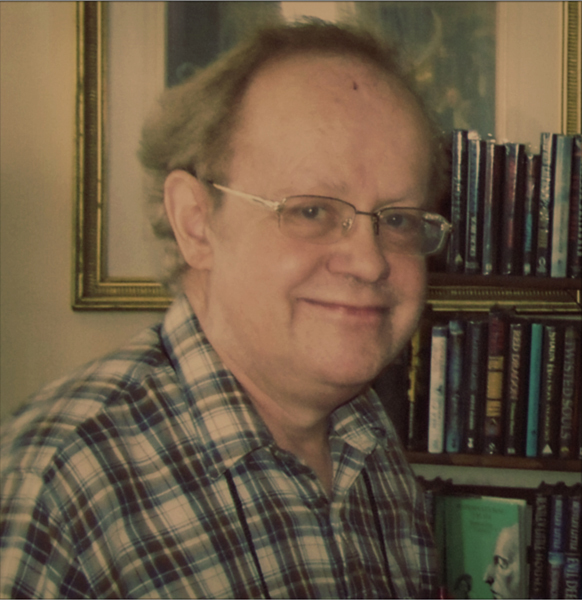 Richard's vast scholarship in the field of supernatural fiction will be sorely missed. While we never met in person, he was a very dear friend and correspondent for thirty years or more. --Ken Faig, Jr.
PS sorry, his Summers article was 1991. This is Thomas Kent Miller. Most of my adult life I preferred novels over short stories—Machen being the standout exception, also Hodgson—up to about a dozen years ago, at which time I was bed-ridden for a couple of weeks and did not have the stamina to tolerate longer works. I happened to have a British paperback Carnacki within my reach and reread all the stories with gusto. Not satisfied, I then read right through Joshi's Complete John Silence and the Complete M.R. James. Well, you can guess where this story is going: It wasn't long before I was devouring Richard Dalby's Virago volumes of women’s ghost stories, the Mammoth Books of ghost stories, and all of his Christmas ghost story anthologies. Thus, when I read Mark's notice of Richard's death, I was devastated. It felt like my guide through so much joy suddenly was no more. There is a tangible emptiness now. I'm so glad that when I finally discovered the ghost story, he was right there to show me the way. He is the ONE anthologist who has NEVER let me down. I can list perhaps ten others, all notable in the field, who I am unhappy with, as I often find their selections unreadable. Richard certainly spoiled me! Naturally, the bottom line here is that, with his help, I discovered the Victorian-Edwardian ghost story as a genre and I've never been quite right since. I read some 600 stories right in a row, keeping 3x5 cards so I could keep track. I am sorry to say, though, that I've never been able to locate an affordable The Sorceress in Stained-Glass or his Ghosts & Scholars (with Rosemary Pardoe), though I have their TOC's and have been trying to locate the stories that I don't already have. Yes, indeed, Richard Dalby RIP. However, I can’t help but smile when I think that he is now in the perfect position to prove or disprove any manner of ghostly ponderings. It's very sad news about Richard who was very dear to us. Richard was also kind enough to entrust us with his beloved books. I'd like to let you all know that we will try to keep his memory alive and continue to run his book business. Please pass this message onto anyone else you know that worked with Richard. Very sorry to hear this. I've enjoyed being in touch with Richard again since re-joining the Everlasting Club and have always admired his immense contribution to the field of supetnatural and weird fiction. Very sad to hear this; the late Mr. Dalby was the one to turn on the subject of ghost stories, and I can still smell the musty odour of second-hand ghost story collections. May he rest in peace. Greatly saddened by news of Richard's death. I was fortunate enough to correspond and meet with him from 1986. Somehow, the world just doesn't seem the same - which, of course, it isn't. I am Richard's cousin, Cindy Greenway. After experiencing the trauma of Richard's tragic sudden death it has been heartwarming to read all your personal accounts of his life and work. We were both only children and although Richard led a more sheltered life we always had great fun particularly making up stories and acting them out. It was obvious to the family that Richard was very bright he started making cartoon strips from the age of 5 and not long after that he designed crossword. I thought that you would like to know that I received a letter from him a few days before he passed away. The letter showed how some of you remember him enthusiastic, happy and positive - looking forward to his birthday and attending events. He is now reunited with Nancy & Tom, his parents who gave him their continual love and support. Thank you for kindly sharing your memories of Richard, and particularly for telling us of the letter he sent you, which is exactly the Richard we shall all remember. I had hoped to have given you all more notice but have only just heard that Richard's Obituary is in the Times today. Thank you, Cynthia, for letting us know about the obituary in The Times. It is only right that Richard should be remembered in this distinguished way. I am so grateful to have come across these appreciations of Richard Dalby, whom I only knew as the extraordinary editor of at least ten of the most-prized anthologies of ghost stories that I own (as well as commentator in other collections, like the Ash-Tree edition of Amyas Northcote), His niche might seem to many in some ways rather small, but perhaps it is a telling measure of his accomplishment that upon learning of his death, there is a late-50s man in rural Illinois pouring a dram of Laphroaig and raising a toast to the memory of a virtual companion who has been with him since the 1980s, when I acquired those remarkable _Mammoth Book of Ghost Story_ collections. If you seek his memorial, look around, on tens of thousands of shelves in bookstores, libraries, and homes. Ave atque vale, superb scholar and incomparable guide! It is now almost a year ago that Richard Dalby sadly passed away. Just today I found one of his catalogues in a storage box, which I'd kept for two decades, if not more. It brought back memories of how I once had a pleasant telephone conversation with him. To me Richard always was one of those rare people not only because his knowledge in the field was unsurpassed, but also because of his generosity and pleasant character. I cherish his excellent anthologies to this day.